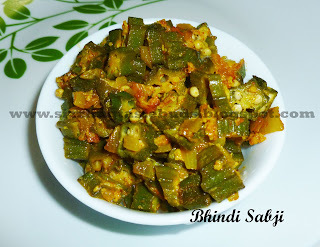 Lady's Finger is known by many names such as Bhindi, Bhendi, Okra, Bhenda, Dheras, as so on. 1 big sized onion finely chopped. 1. Clean and cut the vegetable. 2. Heat 2 tsp oil in a kadai. Add chopped onion and fry till it turns translucent. 3. Add chopped tomato and cook for 2 mins. 4. Now add chopped Okra , haldi, red chilli powder, salt and grated coconut and mix it gently. 5. Cook it in a low flame without adding water and covering the lid for another 5 -6 mins. 6. Yummy and healthy Okra sabji is ready to serve. Serve it with rice or chapati. Enjoy this delicious Bhindi Sabji and let me know your feedback.